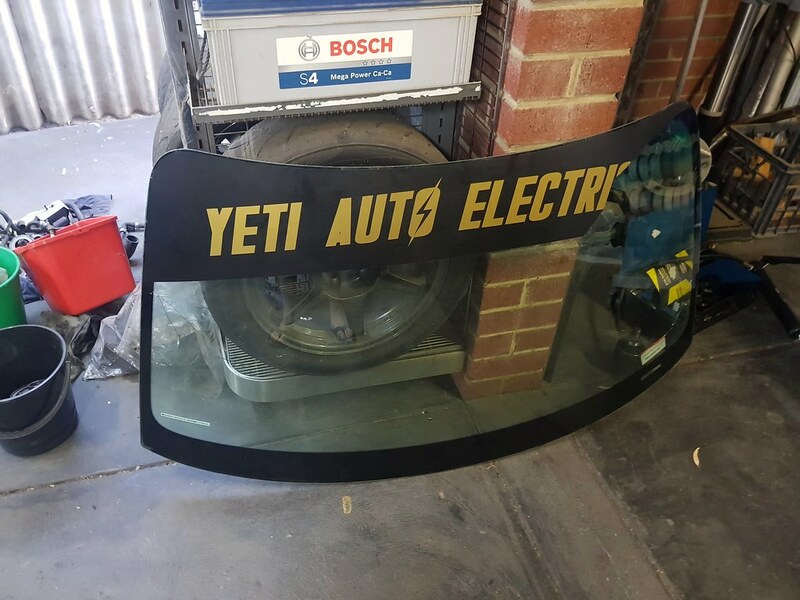 Post subject: Re: Yeti Sled. 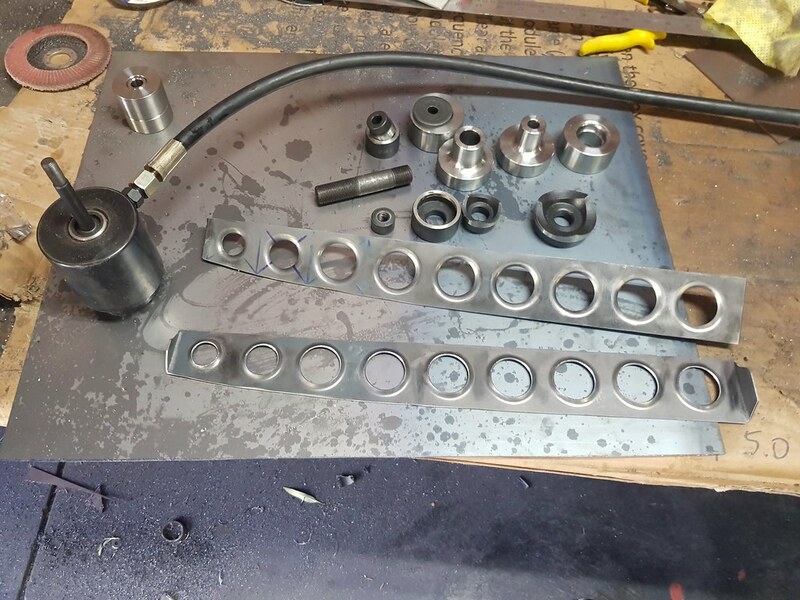 Engine build. A little more progress on the cage. Got the passenger side strut tower bar and an additional small support bar welded in. Well mostly welded in. 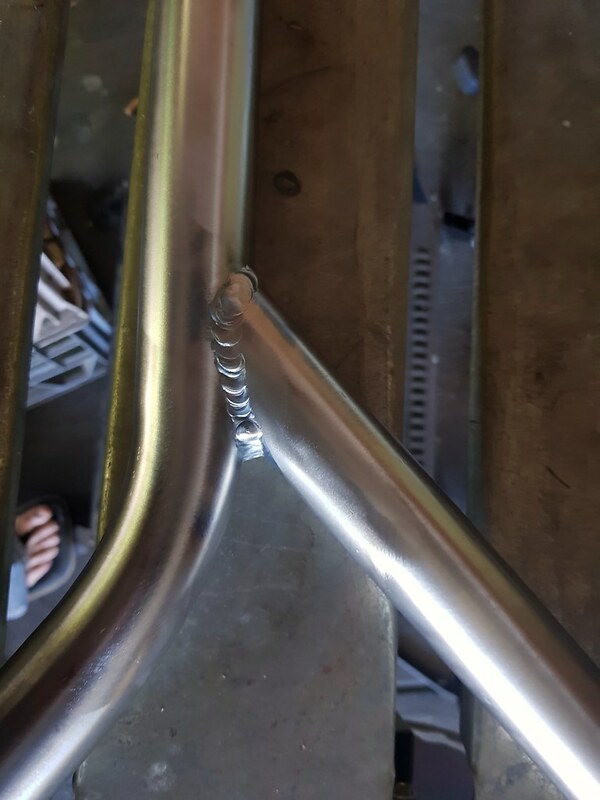 There is a small section of the joins that meet the front leg that is impossible to weld in because its so close to the side of the cabin. Im not sure what im going to do here? The weld on the upper brace to lateral loop front leg might be do-able once the windshield is out. As i can see down there through the windshield enoigh to weld it, if i had access that way. The lower one is going to be extremely difficult. 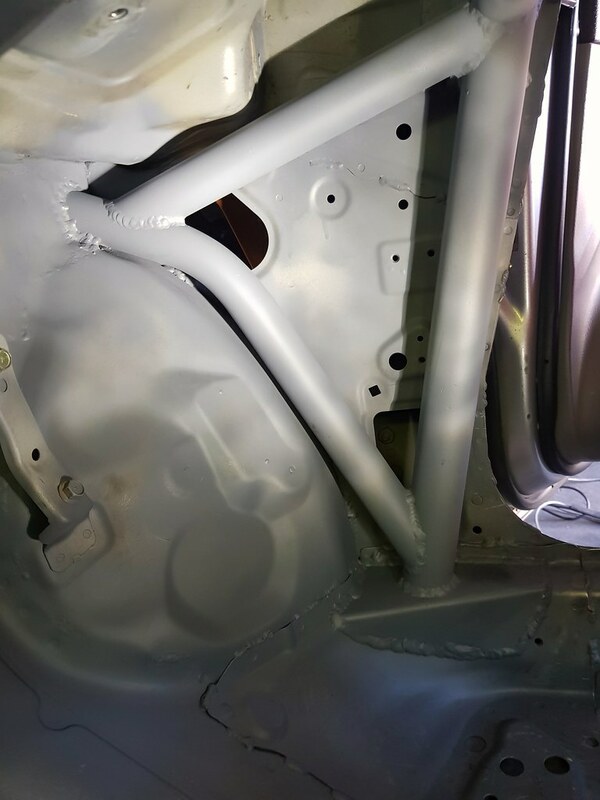 The lower weld does line up with the opening in the panel that the wiring for the passenger door goes though. Which might allow me to get my #9 flex torch in with a stumpy cap and stubby lense. 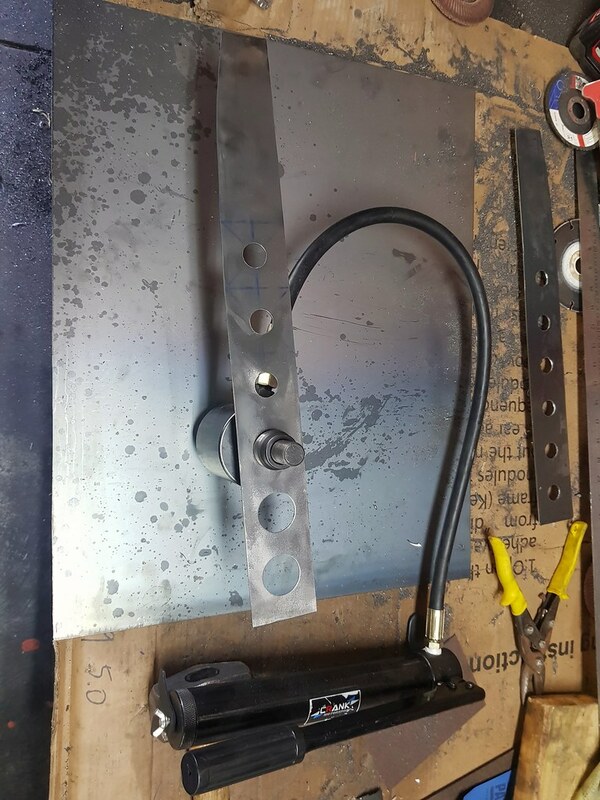 It fits and can target the section that needs to be welded. But I cant see what im doing down there. And it is extremely out of posistion trying to posistion my body in such a way i can even weld it, let alone see it. I did fully weld the small support bar to the bar that goes to the strut tower. 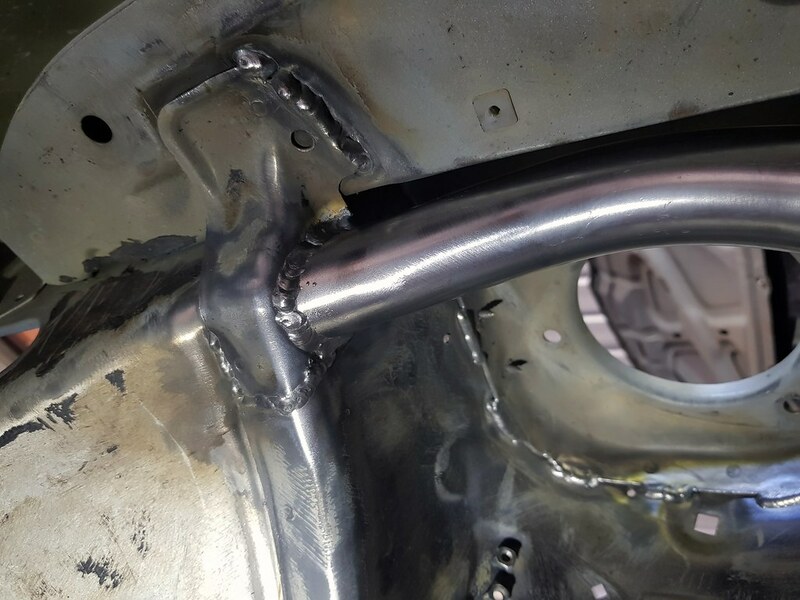 As I was able to fully weld it outside the car, then insert it as a completed unit. The metal plate where the tube pass through is pretty much fully welded. 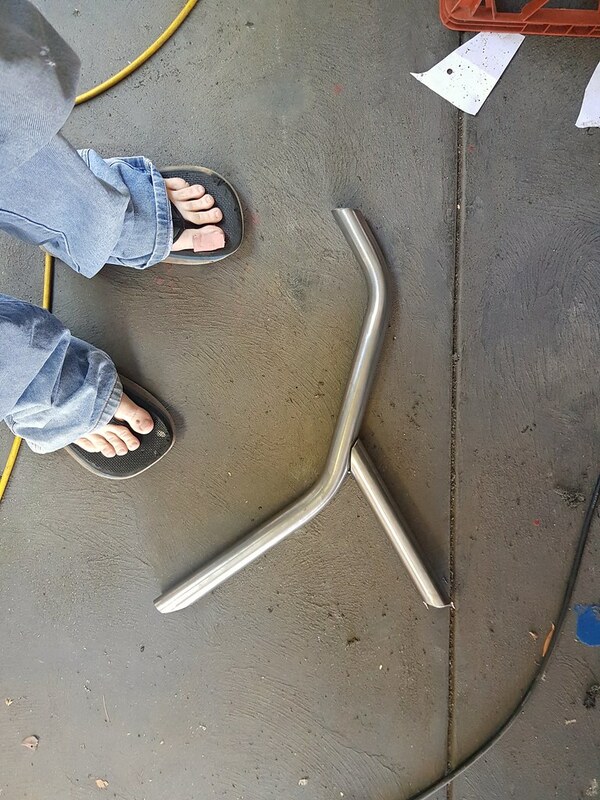 I was able to weld it from both sides giving basically a full circumference weld. Aswell as fully welding the plate into the car. I also welded in my boo-boo hole so that it is less obvious. 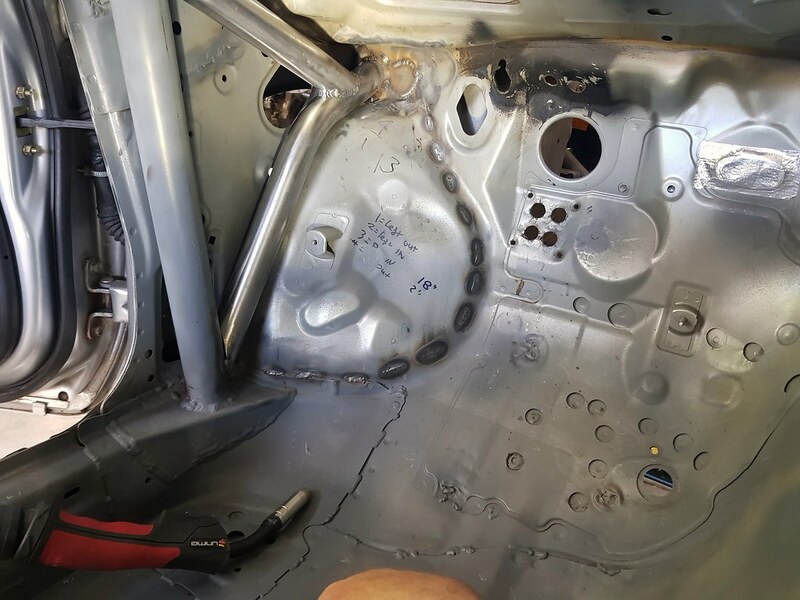 At the forward junction to the strut tower, I was able to basically fully weld the entire circumference with the MIG, by aiming the torch in through the hole in the top of the tower to get access to the back side. This one you can see the stitch welding inside the wheel arch burning through a bit. This is where it meets the forward section of the strut tower. In the back ground you can see where I have stitch welded the tower from the inside. Its much neater way of stitch welding it in. Last edited by Bram on Sun Jan 27, 2019 12:36 am, edited 1 time in total. After such a mamoth effort putting all this together, fingers crossed you never actually get to test the effectiveness of it. Although a cage has other benefits apart from crash survival. 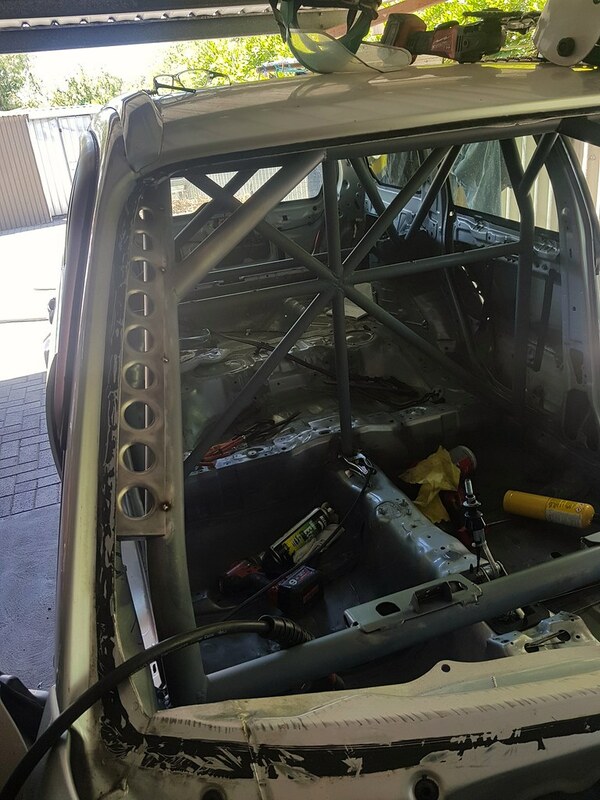 The cage will hopefully subconciously add some extra commitment when i get it back up and racing. Maybe give me a sense of safety that means I will be more willing to push deeper into the corners before braking, and harder through them. I have found the mental anxiety when racing is what holds you back that last 10%, especially once the car gets quick enough to the point where it becomes quite a handfull to manage. Its that fear of dieing that will do things like have you trail braking into a corner, instead of going hard right up to the point at which you must brake. I have heard that a cage will somewhat give you a courage boost that can help get past things like that. And there will also hopefully be some chassis rigidity improvements to be had aswell. 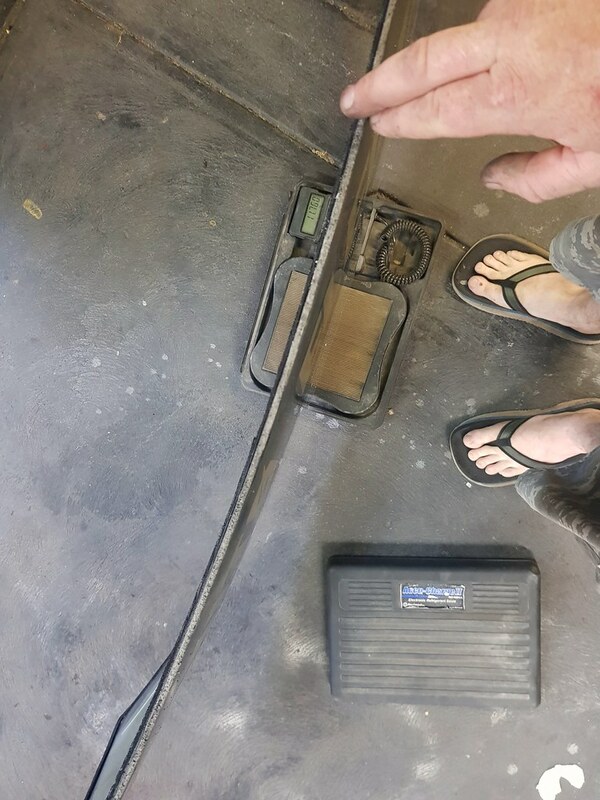 Those forwards strut bars will probably do more in this department, than they would in an accident. Also looks bad arse. There aint many SG foresters with a fully spec'd cage like this. They cover in fine detail at Super Bike school the ‘Survival Reflex’ which we all possess for a good reason, though can get you into a bigger pickle if you listen to it. Trying to mentally over ride a muscle reflex certainly takes a very long time and practice to rewire the brain. I spent a bit of time calculating the wieght of my cage. I measured each piece, and extrapolated out the wieghts from there. Using a value of 2.2 KG per M for the 1.5" tube, and 2.6 KG per M for the 1.75" tube. 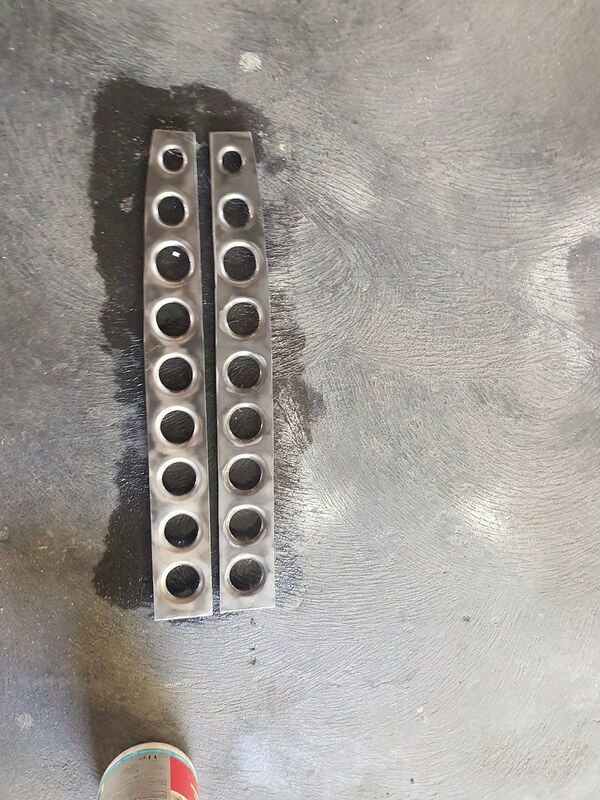 For tubes with coping joins at an angle, i measured to approx half way of each cope joint, to try and get as accurate calculations as possible. I also calculated the sheet metal mounting points by using an online calculator for material wieghts. Although I still have the door bars to go, and a few gussets here and there. Which might bring it up to about 65-70kg all up. And I am contemplating adding a bar from the rear towers to the lower or mid point of the main loop. And maybe even a front strut tower bar that links into the firewall near the pitch stopper mount. So maybe approaching 75-80KG if I go all out. Post subject: Re: Yeti Sled. Roll Cage. Today I removed the front windscreen from the wagon. 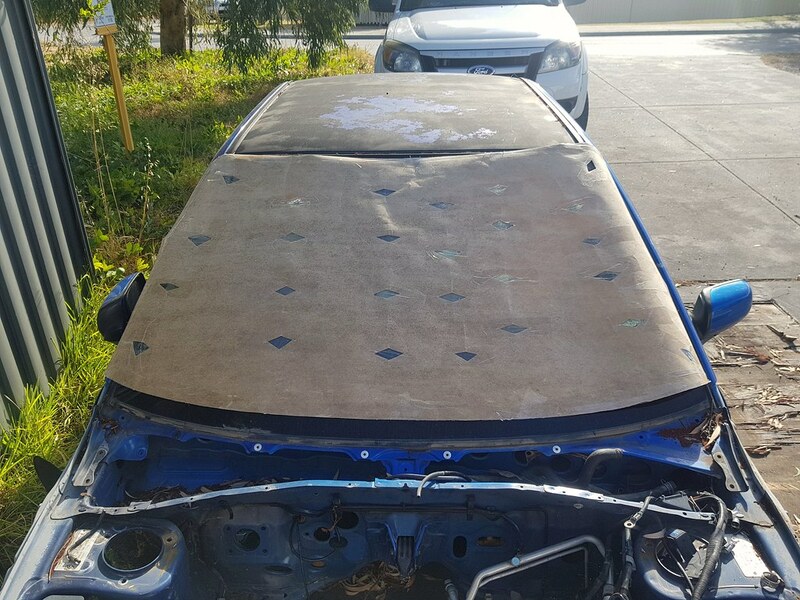 Before removing it, I made a cardboard template of the windscreen. 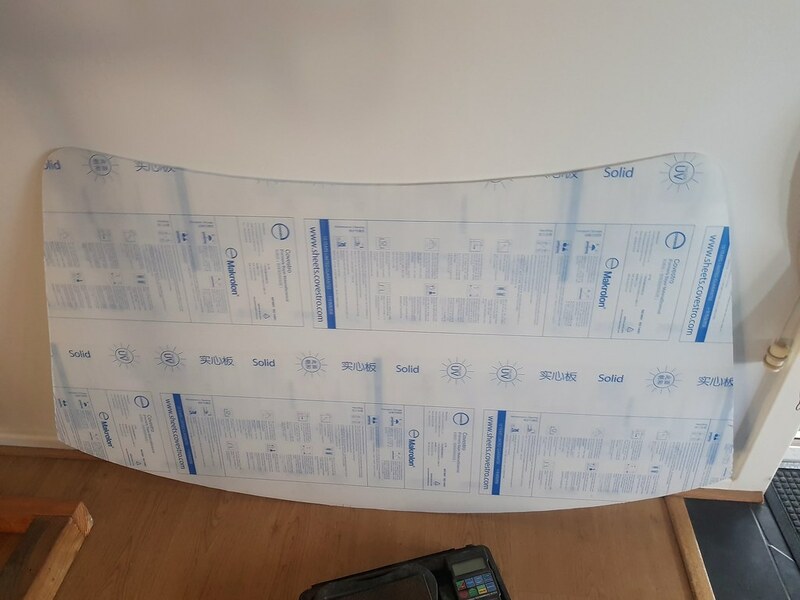 And then used that to make a transfer to the polycarbonate sheet. I did that before attampting to remove the old screen just incase it broke apart. But thankfully it held together. I used the piano wire method for cutting the old adhesive out. First i got a TIG rod and heated it red hot, then poked that through the glue, that made a hole for me to pass the cheese cutter wire through. Then its just saw it back and forwards all the way around. It seemed to work pretty good. As always, I was curious to see the weight differences. 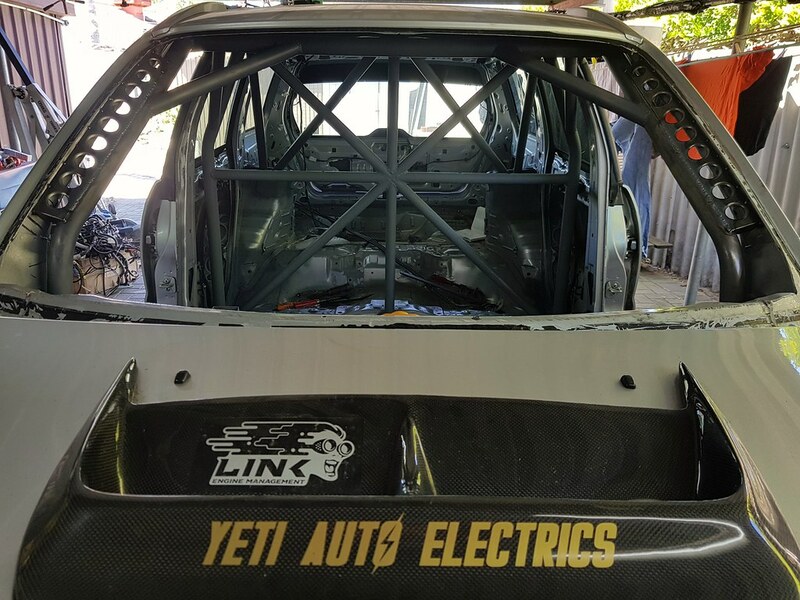 The polycarbonate windscreen wieghs 6.1kg, and the OEM forester glass wieghs 11.76 kg. The polycarbonate is approx 4.5mm thick, which is about the same thickness as the OEM glass. I think it will need a center brace so it doesnt cave in at high speed though, so that might eat into those weight savings a little bit. 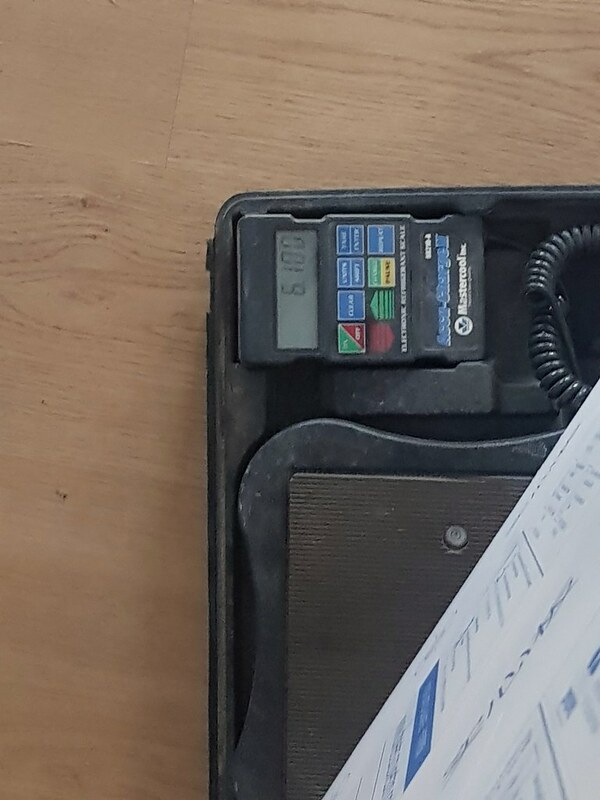 OEM glass = 11.760 KG. There should be even better wieght savings with the rear window and side wagon windows, as I have 3mm polycarbonate to make those out of. 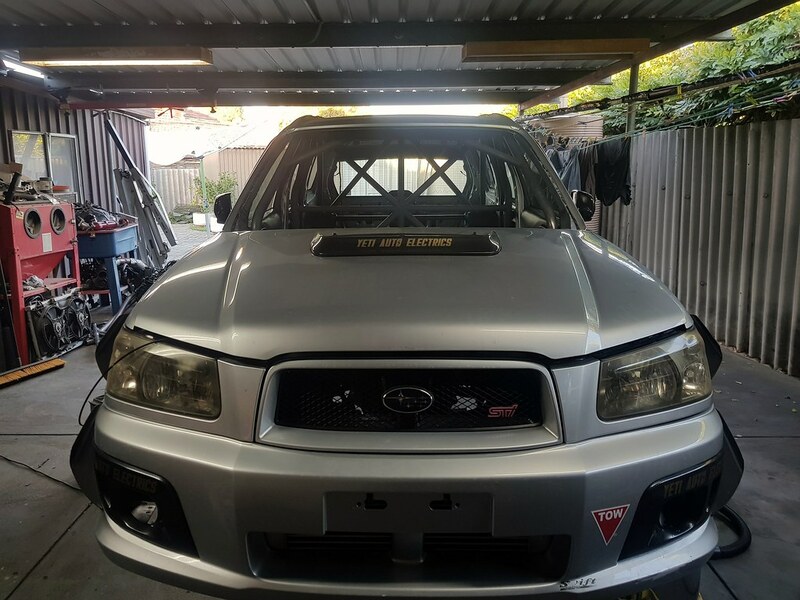 Because I still have the GD WRX wreck sitting out the front, i thought Id compare the forester windscreen to the WRX. And interestingly, the Forester window is actually SHORTER than the WRX by about 2 inchs. The forester window is also about that much wider than the WRX. I wasnt expecting it to be shorter. Which is nice because if its a smaller window, it means its also going to be a little lighter. I have some 10H nano diamond coating that I will experiment with on some scraps of polycarbonate. 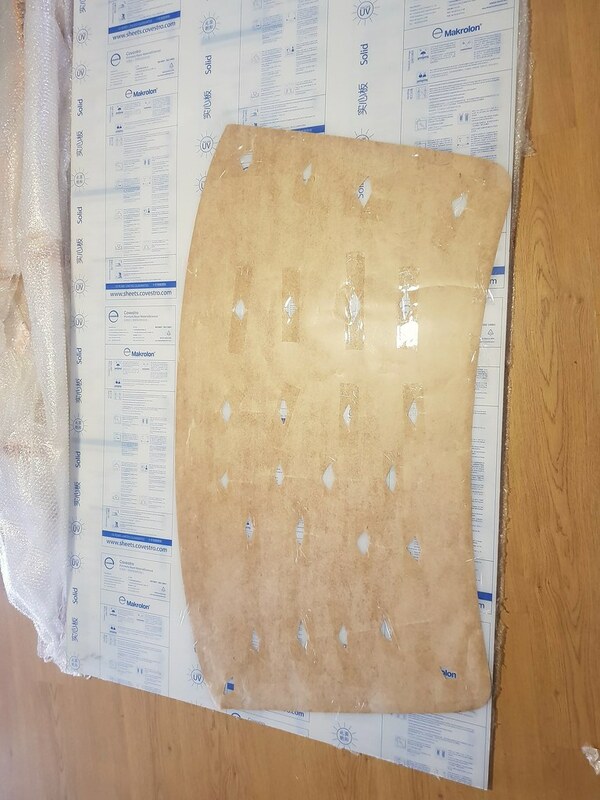 Its special a coating that you can apply to give a strong scratch resistent layer over things. Polycarbonate is quite impact resistant, but not very scratch resistant. And is known for scratching very easily. I have heard these coatings are the DIY way of making polycarbonate very scratch resistent, without buying the expensive pre-coated polycatboante sheet. It is also hydrophobic aswell, so water should just bead right off it. Which might mean I can ditch the front wiper aswell, to save a little more wieght. Now that the window is out, I can make the A pillar gussets. I have a small sheet of 1.6mm hot rolled mild steel, which should be perfect for making gussets. Keen to see how the windows turn out! Although there is still a bit to do before the windows are in. I just wanted to make the front one before i pulled the front glass out, because there was the risk of me braking it apart. And that would mean making the replacement window alot more difficult. With the window out, i can get to work fabricating the A pillar gussets. I used my hydro hole punch to knock out some holes. Then used the dimple dies to dimple out the holes. I think i got the spacing pretty good.